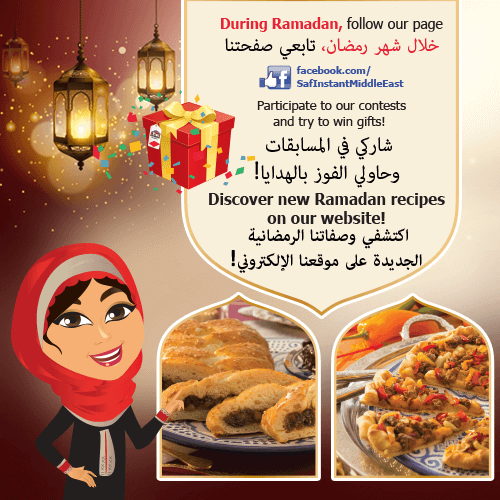 New recipes to share with your family! 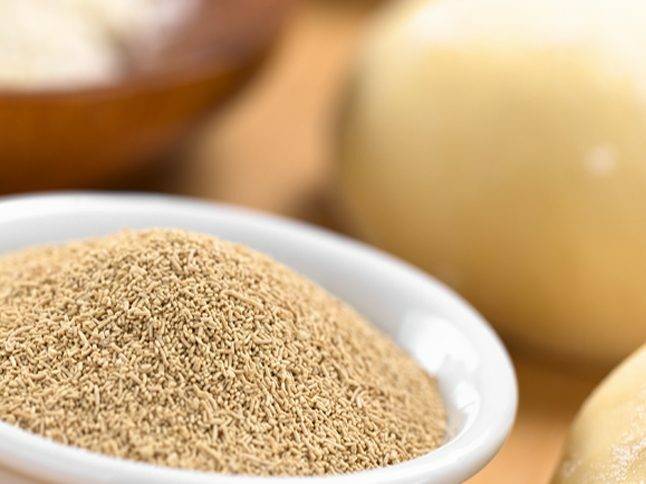 Over the years, Saf-instant has become a brand which is well known, recognized and appreciated all over the world and is now the leading product in the international dried yeast market. 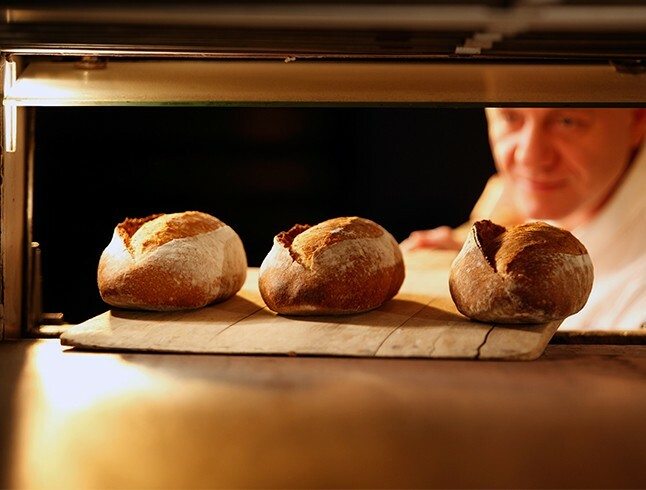 Thousands of bakers and household bakers, with vastly different backgrounds, culture and areas of expertise, have relied on Saf-instant for generations. 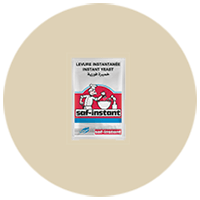 Saf-instant Red 11 gr is a ready-to-use instant dry yeast for household use intended for a wide range of recipe types: bread, brioche, pizza, etc. All are easy to use and ensure excellent results. 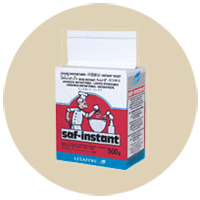 Saf-instant Red 125 gr is an instant dry yeast which has been specially developed for lean or low sugar dough (0-10% of sugar on weight of flour). Saf-instant yeast is vacuum packed for better quality and effectiveness. 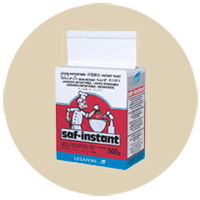 Saf-instant Red 500 gr is an instant dry yeast for household use and for craft bakeries. This yeast has been specially developed for lean or low sugar dough (0-10% of sugar on weight of flour). 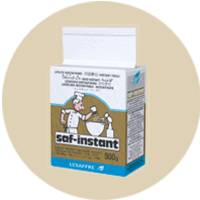 Saf-instant yeast is vacuum packed for better quality and effectiveness. 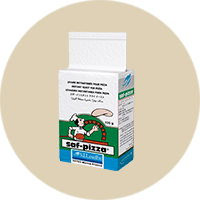 Saf-pizza 125 gr is a ready-to-use instant dry yeast suitable for household use and craft bakeries and specifically adapted for pizza-making. With Saf-pizza, your dough is easier to stretch and pizza bases are faster to shape! 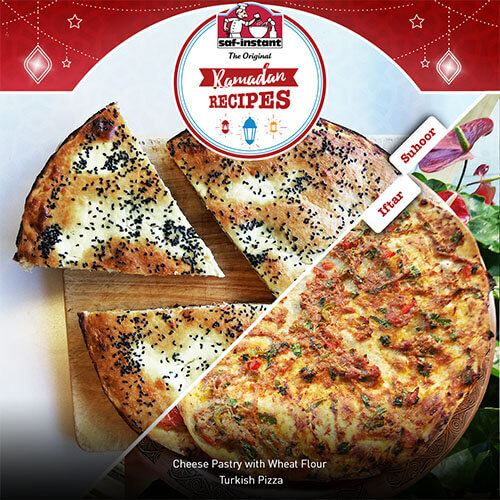 It is time to get ready for delicious pizzas that you can enjoy at home with your family! 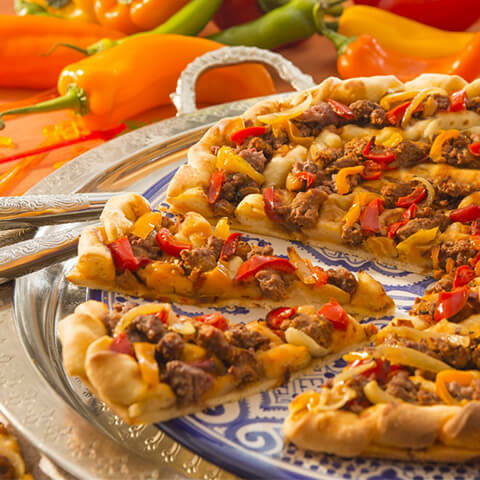 You can also use Saf-pizza for any type of dough. It is vacuum-packed for better quality and effectiveness. 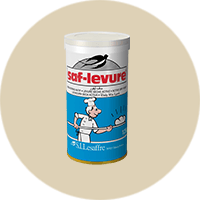 Saf-levure 125 gr is a dehydrated active dry yeast which is perfect for all bread-making processes. You should rehydrate Saf-levure before starting to use it. Saf-levure is extremely stable at room temperature and easy to conserve! 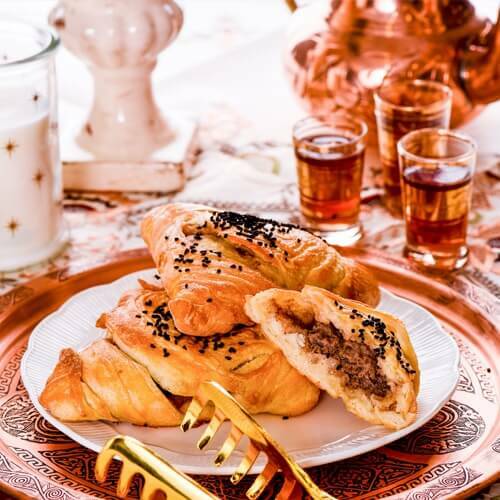 Saf-instant Gold premium dry yeast is a sugar tolerant yeast that provides perfect results in recipes such as croissant, danish, brioche, sweet bread and donut. This yeast is adapted to dough with sugar level higher than 5%. It is vacuum-packed for better quality and effectiveness. 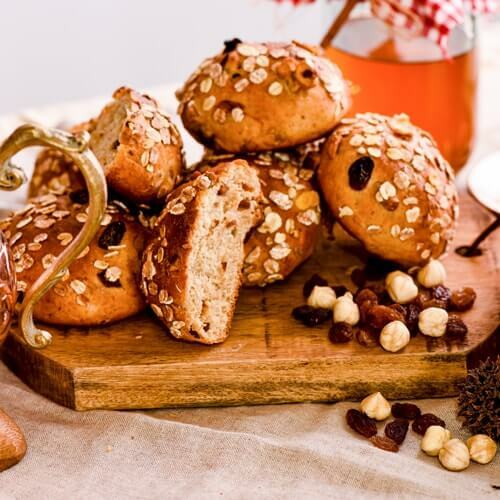 Saf-instant Gold premium dry yeast is a sugar tolerant yeast recommended in doughs with a sugar level higher than 5%, such as croissant, danish, brioche, sweet bread and donut, providing uniform fermentation throughout your baking system. It is vacuum-packed to ensure better quality and effectiveness. Add Saf-instant, Saf-instant Gold, and Saf-pizza yeasts directly to the flour or at the start of the kneading process. 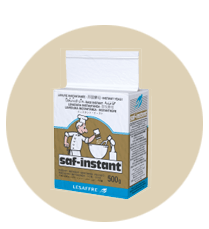 Saf-levure should prior be reactivated by rehydration at a warm temperature. They all disperse easily and uniformly into the dough and gives optimum fermentation. Expiration date is 1,5 years from date of production. Saf-instant Gold, Saf-pizza and Saf-levure yeasts must be kept in a dry place away from heat and direct sunshine to preserve its quality. Once opened, the sachet must be used within 48 hours or stored sealed in the fridge to be consumed within 8 days. Since more than 40 years, you have been trusting our brand and products. 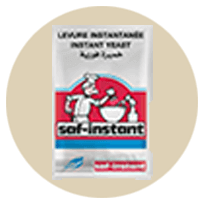 We commit that Saf-instant and all of our yeast are produced in accordance with the Halal certificate. 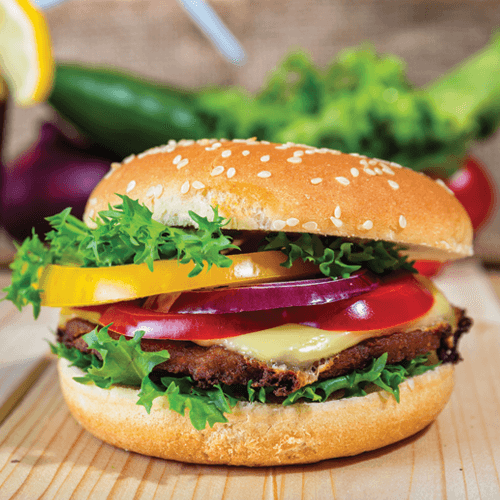 The E491 emulsifier that is used in our yeasts is from vegetable origins, 100% guaranteed without any trace of pork in it. 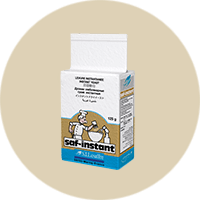 Saf-instant was the first instant dry yeast in the market. 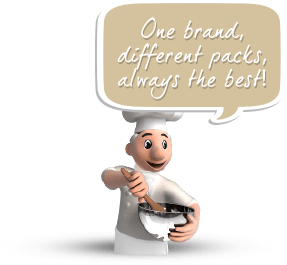 Therefore Saf-instant very quickly revolutionised the baking profession by offering a high quality yeast accessible to all. 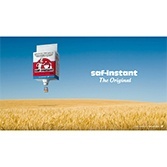 Saf-instant is now the most widely available brand worldwide. 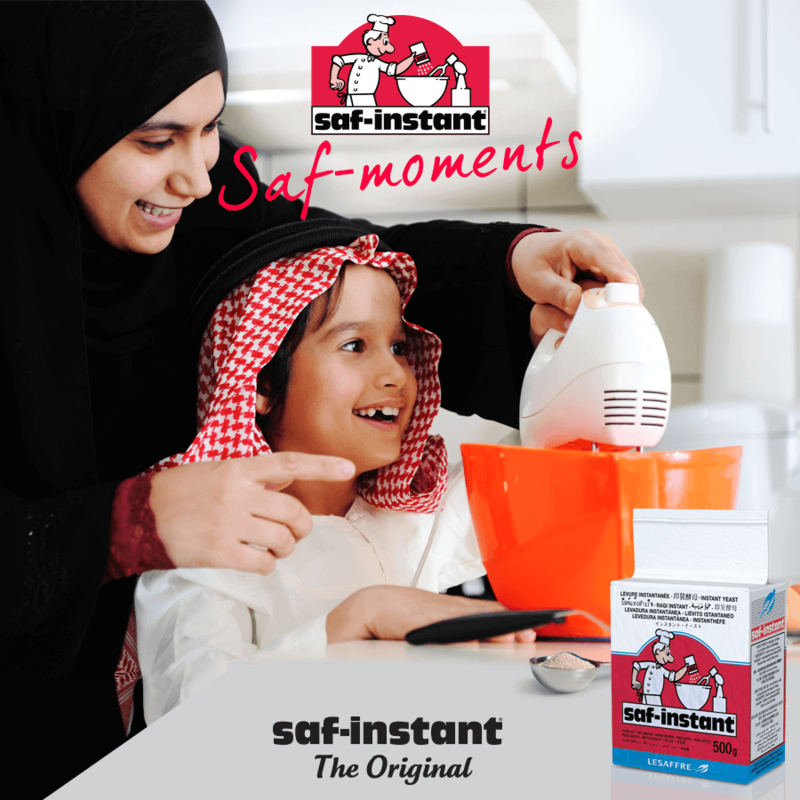 Over the years Saf-instant became the reference for the household bakers! 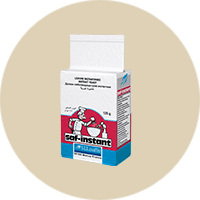 Saf-instant yeast offers superior fermenting power and great stability over the time. As such, it guarantees optimum bread quality almost every time. 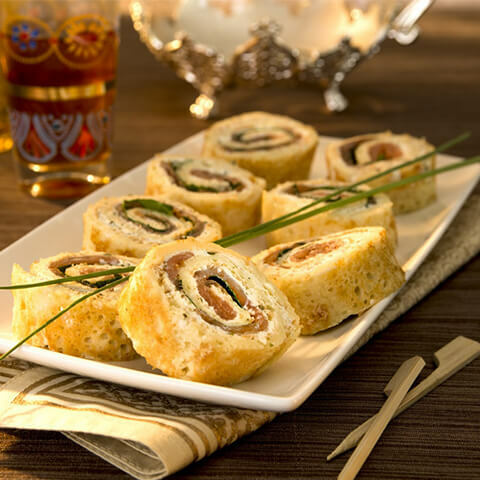 With a unique yeast, make unique breads and enjoy unique ‘’Saf’’ moments. 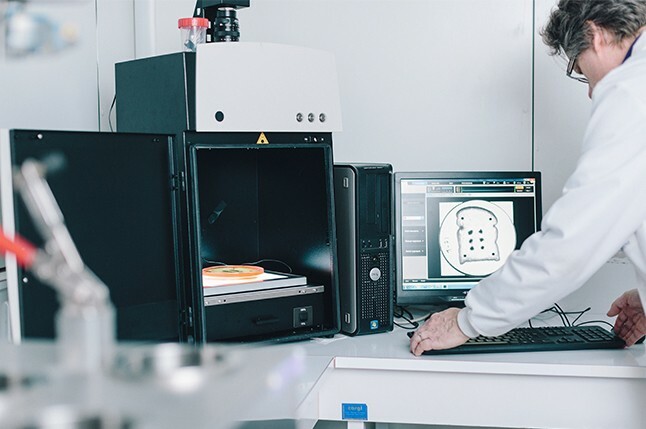 Research has always been one of Lesaffre’s top priorities and Saf-instant benefits from the very latest innovations in strain selection, processing and packaging. More than 200 researchers actively collaborate with more than sixty universities and research centres around the world to create innovative products that have been proven and guaranteed. The innovation at the service of the customer, we are ready to offer you always the best, always the original, always Saf-instant. We do not manufacture yeast. We grow it. 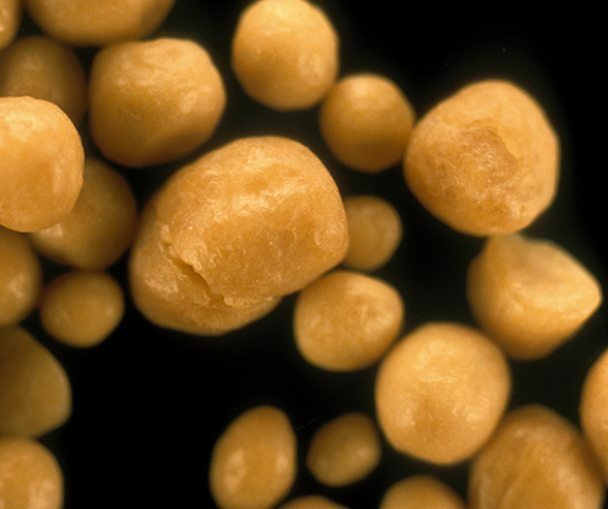 Yeast is a living microorganism. This microscopic fungus is no larger than 6 to 8 thousands of a millimeter in size, yet has exceptional fermentation characteristics. Yeast is used in the bread-making process. In the absence of air, it produces gas and aromas. It ferments sugar present in flour and gives more volume to bread. 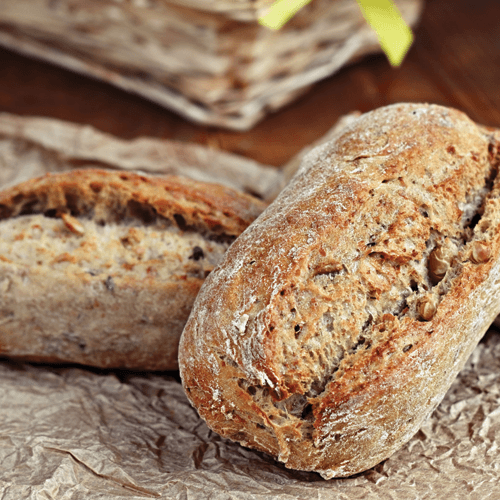 Yeast can be used for a variety of purposes that includes making bread dough rise and contributing to the flavour, sensory and nutritional qualities of bakery products. 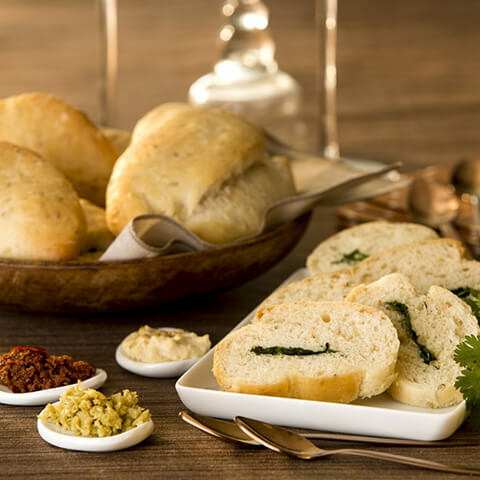 Yeast plays indeed a very important role in regulating the aromatic and fermentation activity of bread. The taste of your bread is mainly due to the yeast. Containing minerals, vitamins and amino acids, yeast offers many benefits, giving it a crucial role in your diet and balance. For example, yeast and its derivatives are used in food supplements to complement our diet, ensure your well-being and help to improve your health. 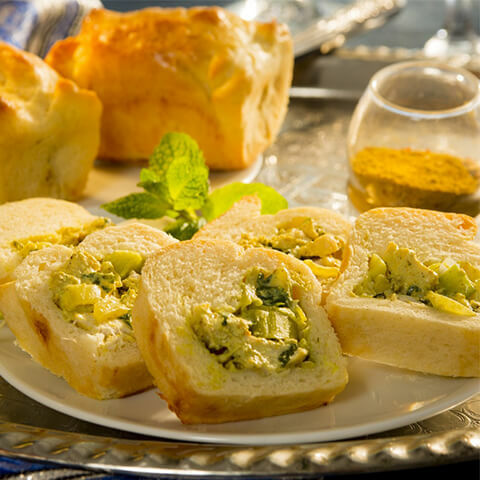 Nutritional yeast can be ideal for vegetarian diets, but is also very useful for healthy hair, nails and skin. 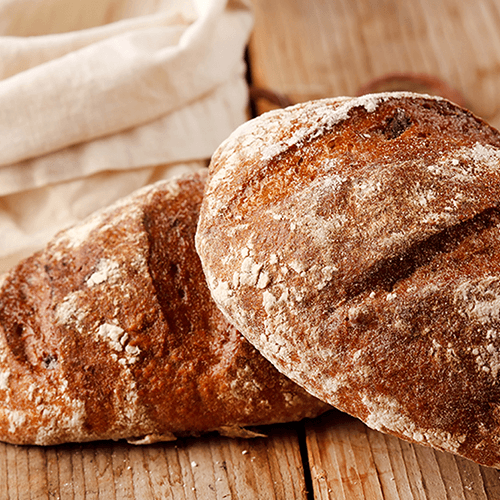 Enriched with vitamin B and minerals, yeast can also compensate for nutritional deficiencies. Yeast is well known to boost your immunity system, to help keeping the balance of the microflora of your bowels, and to fight oxidative stress. 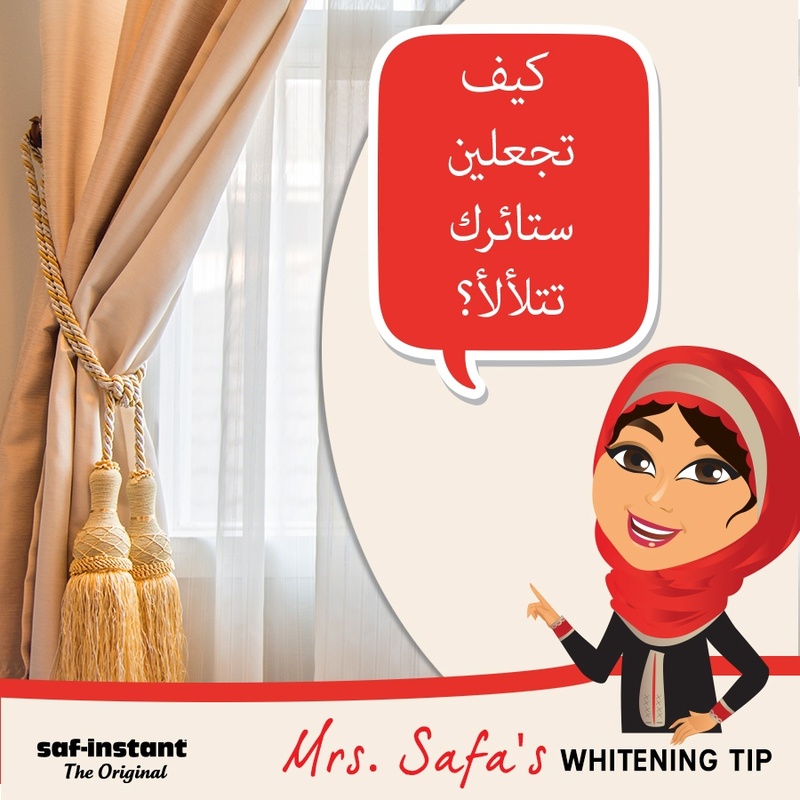 Join us on Facebook and follow Mrs. Safa’s tips and our homemade recipes. Since 1853, thousands of men and women have contributed building Lesaffre by sharing their expertise and passion. Now Lesaffre is a key-player in yeast, yeast extracts and baking ingredients, holding global presence with more than 9500 employees in more than 70 subsidiaries based in over 45 countries with a priority to better nourish and protect the planet. Authentic, unique and innovative, Saf-instant invites you to climb aboard its hot air balloon: an international advertising campaign for a brand that has close ties with bakers everywhere. 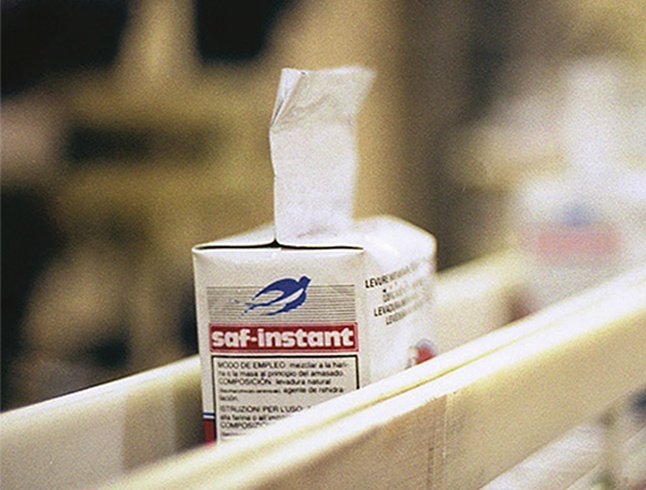 Lesaffre was the first to market an instant dried yeast product. It was highly effective and easy to use, comprising dehydrated noodles that could be added directly into the dough mixer. 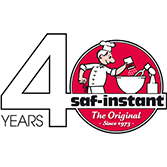 Saf-instant is forty years old, and as committed to bakers as it ever was! 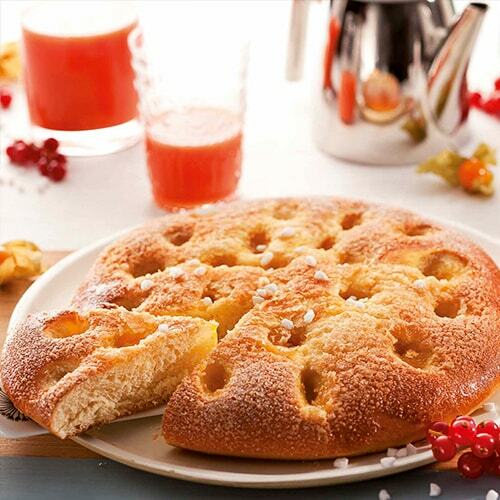 Did you know that Lesaffre has 38 Baking Centers all around the World? 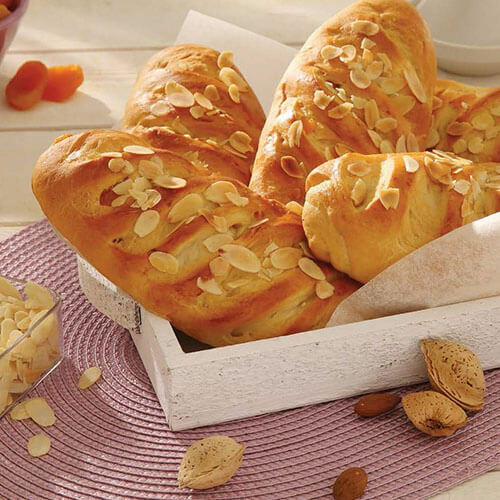 Opened in 1974 in France, Baking Center has been sharing the Lesaffre’s know-how and became a global reference point for bakers and household bakers all around the world. Our Baking Center of which Lesaffre celebrated 40th year, is based in Istanbul, Turkey; with an advantageous proximity to assist and guide our customers from Middle East. 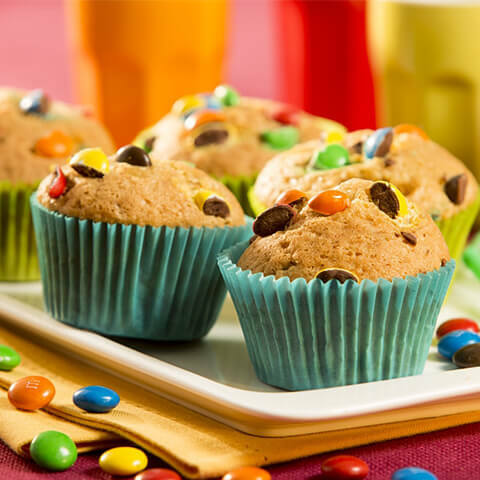 Our team of baking experts have high experience in any baking-related problematics that comes from your kitchens at home. 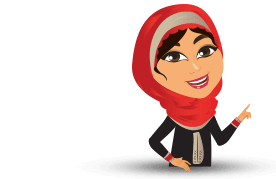 By checking here, I allow Lesaffre to deliver commercial communications to me through emails and SMS using my personal contact information above, in relation to activities, organizations, events, sales and campaigns presented by Lesaffre. Fill Captcha before send the form. *For the best results, first bring the ingredients to room temperature. In a mixing bowl, combine the flour and the Saf-instant yeast. Add the water and milk and knead for several minutes. 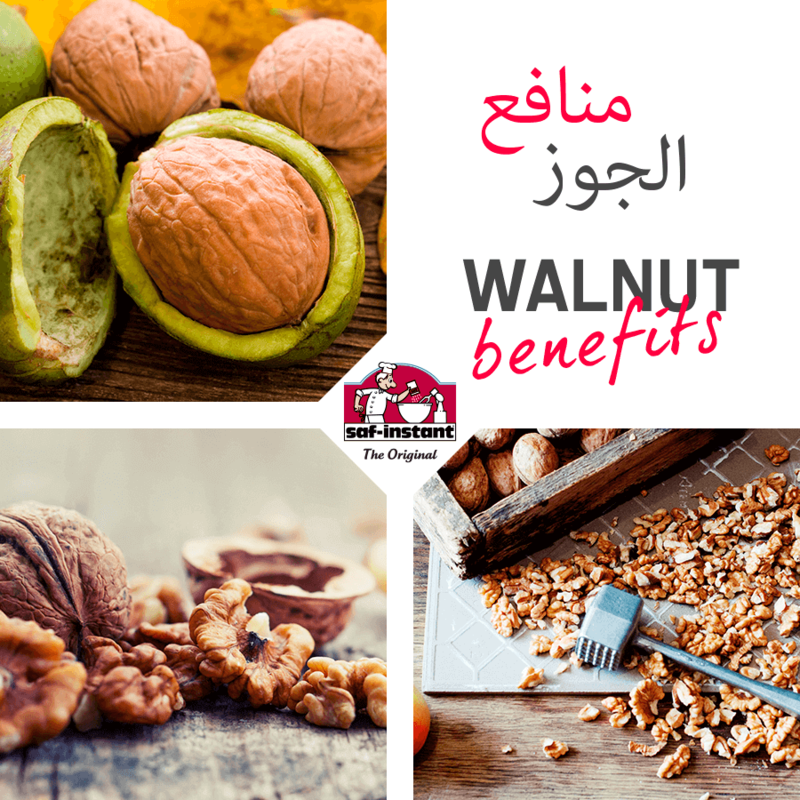 Add the salt, oil and the walnuts and knead for a further 15 mins until the dough comes away from the sides of the bowl, then shape into a ball shape. Cover with a clean tea towel and leave to rise for 1h. Next, take the risen dough and work it energetically into a ball again. Transfer dough into a greased dish. Leave to rise again for 1h. Using a pastry brush, coat the dough with the beaten egg. Bake in oven for 35 mins at 200-220°C. 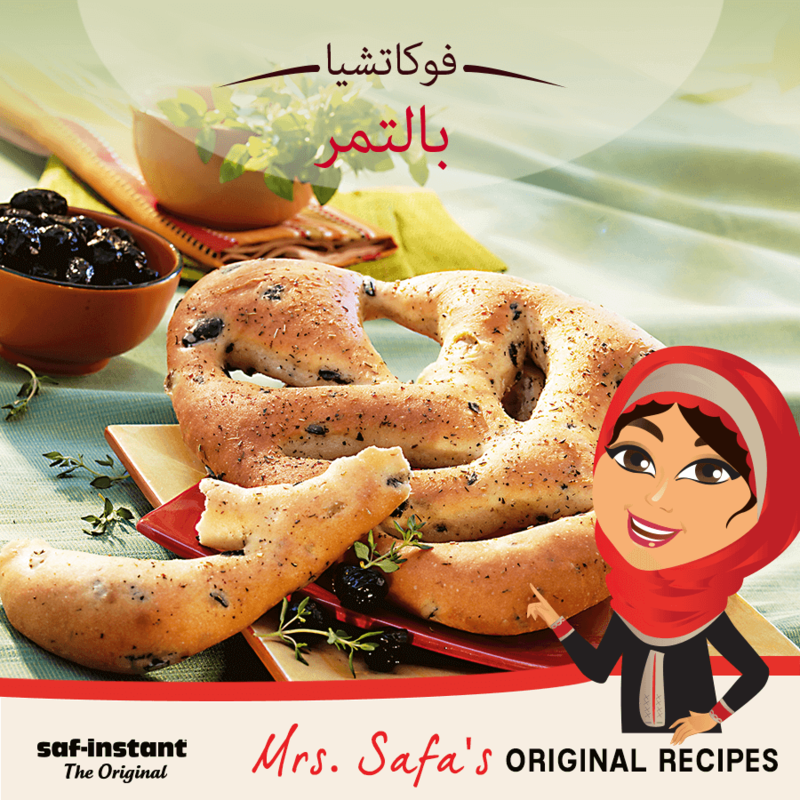 In a mixing bowl, combine the flour, salt, oil and the Saf-instant yeast working the mixture into a consistent dough. Finish kneading with a rolling pin. Add the previously chopped dates to the dough and shape into a ball. Put the dough in the bowl and cover with a clean tea towel. Leave to rest for 30 mins at room temperature. Remove the dough from the bowl and divide it into equal parts of about 350g. Cover and leave to rest another 10 mins. Shape 1.5 cm thick triangles using a rolling pin. Then using a knife, make 6 incisions on each triangle in the shape of an ear of wheat. Place the triangles on a baking tray, cover and leave to rest for 1h. Using a pastry brush, moisten the dough triangles with water. Bake for 15 mins in a pre-heated oven at 230°C. Upon removing from oven, brush the focaccia with olive oil. 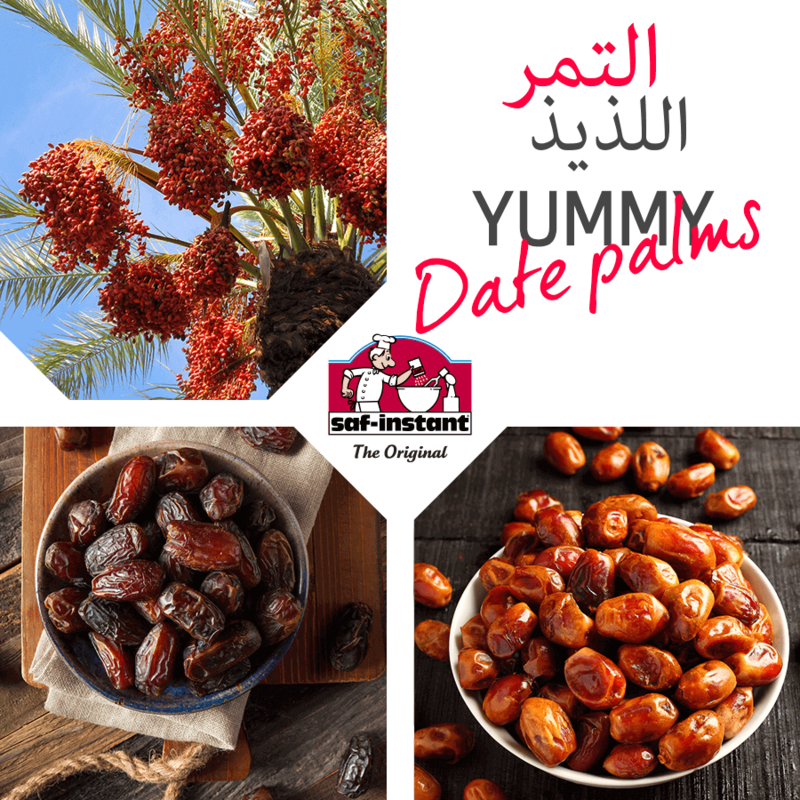 In a bowl, combine the flour, oil, sugar, egg yolk, salt and the Saf-instant yeast. Gradually pour in the warm milk until a soft dough is formed. Leave to rest for 15 mins, then knead and leave to rest for a further 15 mins. Shape the dough into balls. 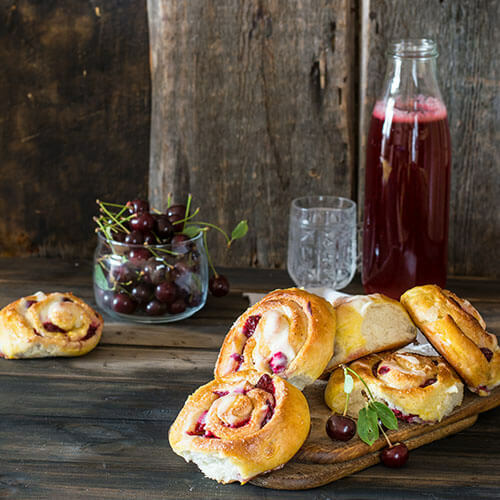 Transfer the dough balls into previously greased metal bun moulds, or if not available, on a baking tray covered with grease-proof paper. In a mixing bowl, combine the flour, sugar, salt, milk and the Saf-instant yeast, until the mixture forms a consistent dough. Leave to rest for 1h 30 in the fridge, covered with a clean, dampened tea towel. Remove butter from fridge beforehand and wrap in grease-proof paper. Using a rolling pin, spread the butter into a square shaped slab (of approx. 30x30cm) approximately 0.5cm thick. Remove the dough from the fridge and shape it into a 0.5 cm thick rectangle (of approximately 30x60cm). Place the slab of butter on the right-hand half of the dough then fold the left-hand section over it. Fold the edges of the dough in well. Roll the dough to form a new 30x60 cm rectangle and fold into thirds lengthwise so as to form a new rectangle. Leave the dough to rest for 1h in the fridge then repeat the process a second time (rolling and folding the dough into thirds then leaving to rest for 1h). Remove the dough from the fridge and roll out into a large 0.5cm thick square. Cut into triangles of 10x15x15 cm. 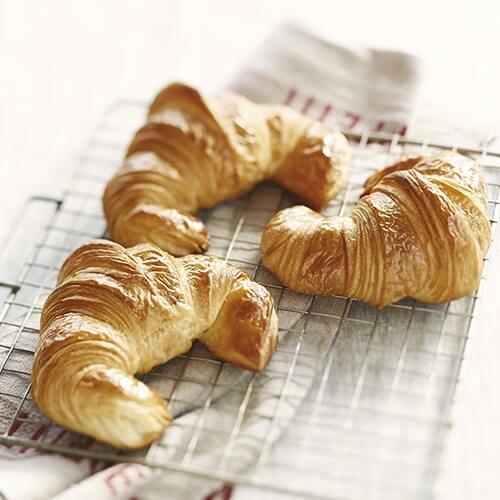 Starting from the base, roll the triangles to form croissants. Place the croissants on a baking tray, cover and leave to rest, allowing the croissants to rise. Then, using a pastry brush, coat the croissants with the beaten egg and bake at 170°C until they turn golden (about 20 mins). 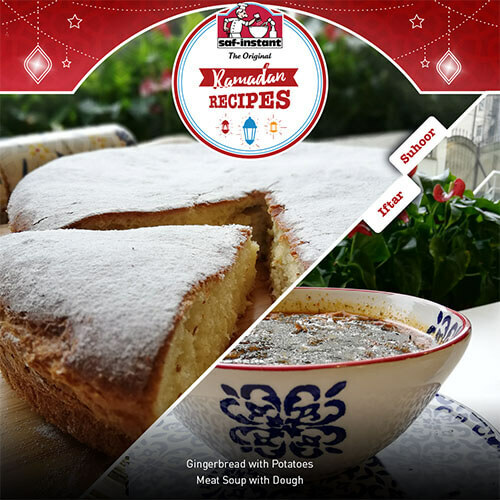 In a mixing bowl, combine the flour, sugar, milk, Saf-instant yeast, and the aniseed and fennel seeds. Pour the oil over the mixture, add the egg then mix together, gradually adding the warm water until a soft dough is obtained. Leave to rest for 30mins. Stretch the dough into a round shape in a greased oven-proof dish and coat with the beaten egg. Using a knife, make incisions in the dough and leave to rise for 10mins. Transfer the dough into a floured dish and bake at 200°C until the bread has turned a golden colour. Combine the dough ingredients. Leave to rest for 1 hour, then roll out the dough and fold it up 4 times. Cut out 8 triangles. 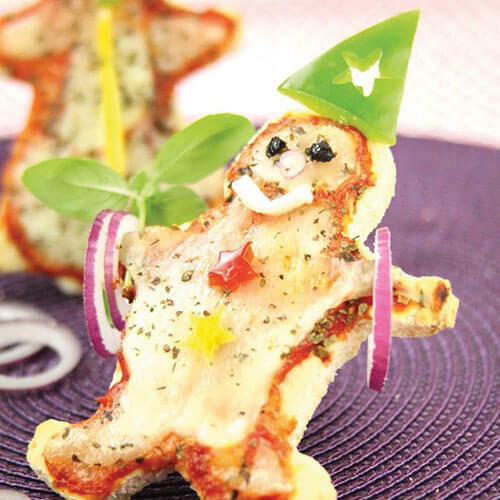 Garnish each one with tomato pizza sauce, a little chicken, grated cheese, salt, cumin and pepper. 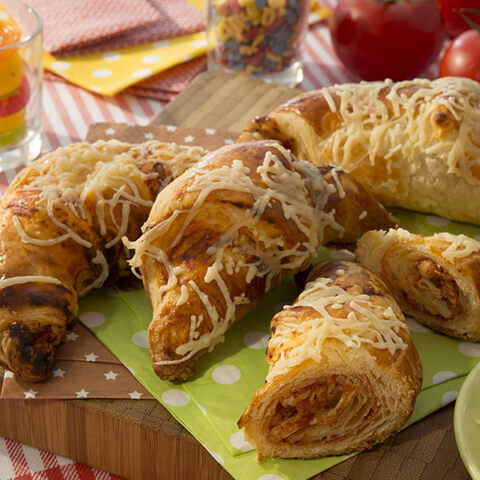 Roll up the croissants and sprinkle with cheese. Bake in a preheated oven at 220°C for 20 mins. Dissolve the yeast in 50ml of warm water. In a mixing bowl, combine the flour, salt, sugar, yeast mixture, egg, olive oil, sesame seeds and 250ml of warm water. Bring together then knead well. Leave the dough to double in size. Roll out onto a floured worktop. Cut out 10 rectangles, top each one with coriander. Close the rectangles and pinch the edges, dampening a little. Leave to rise for another 30 minutes, brush with olive oil and bake in a preheated oven at 210°C for 15 to 20 minutes. In a bowl, mix the flour, sugar and salt with the olive oil and the yeast dissolved in 50ml of warm water. Add a small glass of water, bring together and knead for 5 minutes until the dough is soft and elastic. Leave the dough to rise for 30 minutes. While it is proving, heat 2 tbsp of olive oil in a frying pan. Add the chopped onion, minced beef, deseeded and diced peppers, finely chopped garlic, oregano and cumin. Season with salt and pepper, cover and cook over a gentle heat for 10 minutes. Roll out the dough on a floured worktop. Cut strips of dough, roll into wheels and place in a round oiled baking tin, leaving 2cm between each wheel. Fill the gaps between each wheel with the meat and vegetable mixture. Sprinkle with oregano and a spoonful of olive oil. Bake the pizza in a preheated oven at 210°C for 25 mins. Combine the dough ingredients, knead for 8 minutes then leave to rise for 2 hours. Make two baguettes, Sprinkle with the seeds. Bake in a preheated oven at 200°C for 20 mins. 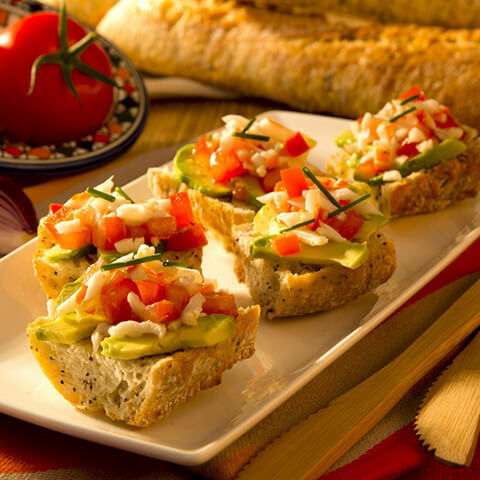 When the bread has cooled, cut each baguette in half to make 4 half-baguettes and fill with diced tomato, slices of avocado in lemon, diced red onion, crumbled surimi and a dash of mayonnaise. Mix all the pastry ingredients together and prove for 4 to 5 hours, or make the day before. In a frying pan, cook in oil the finely chopped onion, sliced leek, chopped chicken and curry powder. Add the herbs and the cream and boil for one minute to thicken the sauce. Roll out the pastry and cut out 16 squares. Fill 8 squares with the chicken filling, cover with the other 8 squares, pinch shut along the edges and brush with the beaten egg to glaze. Combine all the pancake ingredients and leave to rise for 2 hours. Cook the pancakes for 2 minutes on each side in a frying pan. Leave to cool before spreading with cream cheese. On one half, lay a slice of smoked salmon and a lettuce leaf. Roll up and cover tightly with foil. Repeat with all the pancakes. Refrigerate. Slice into 3cm wheels just before serving. In a bowl, mix flour and salt. Add warm water, lemon peel and yeast. Knead until the dough becomes smooth. Shape a big ball with the dough and put it back in the bowl. Cover with a damp cloth and let stand for 10 min at room temperature (25-28°C). Spread the dough with rolling pin and make a big rectangle shape which is 1 cm this. Set a trace horizontally from the center (You can determine this trace by simply folding the dough). Then cut it into a zigzag shape with a dough knife to obtain triange-shaped doughs. Take three cuts perpendicular to the triangular dough. Roll the salmon on the broad side of the triangle and give it a crescent shape. Put these crescent shapes onto a greased oven tray and cover them with a damp cloth. Leave it to rest for 30-40 min c.
Cover the doughs with beaten egg with the help of a brush. Then bake for 20-25 min in the preheated oven at 210-220 °C. Fry the hazelnuts gently in the oven, then beat the hazelnuts. Mix salt and flour in a bowl. Add warm water, yeast, butter, honey and knead to obtain a homogenous dough. At the end of the kneading, add chopped apricot, dried grapes and beaten hazelnuts, get the batter together and let it rest for 10 minutes under moist cloth. Divide the dough into 10 tangerine-sized equal pieces (75 gr). Prepare a plate with a little water. Dip the tangerine-sized dough balls into the water first and then mousli. Place them into the greased oven tray and let it rest another 55-60 minutes more in the room temperature. 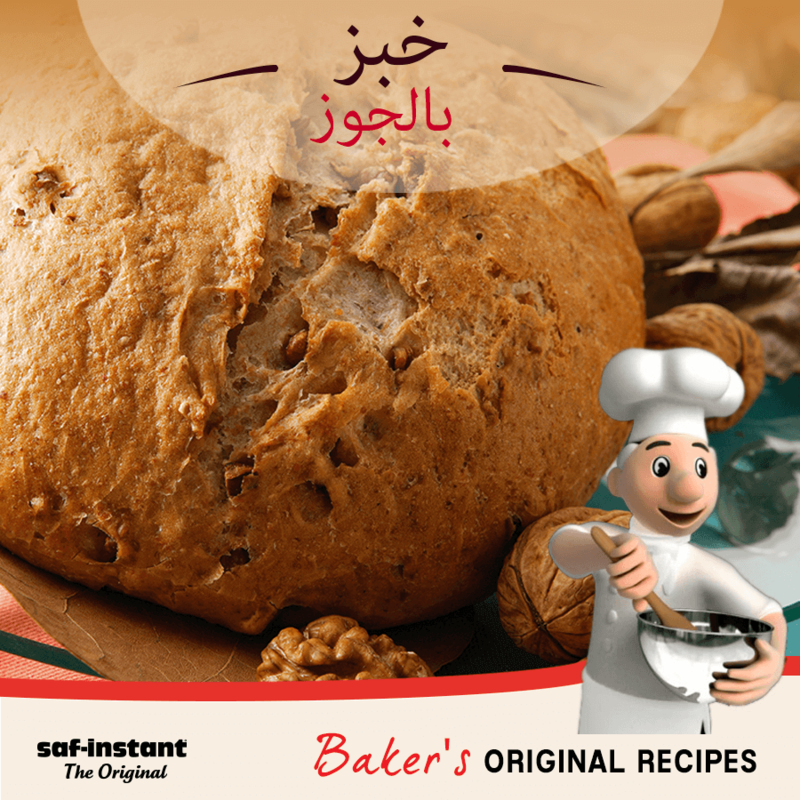 Spray some water on the mousli breads and bake for 15-20 minutes in a preheated oven at 200-210 degrees. Mix flour, sugar, salt and yeast in a large bowl. Add egg yolks, oil and warm milk bit by bit and knead until The dough is soft homogenous. Rest for 15 minutes. Make tangerine-sized balls of dough for about 40 gr each and roll them firmly. Leave them to rest for 5 minutes and put them into the greased oven tray. Lightly press and straighten them with your palm. Cover with a damp cloth and let it rest at room temperature (28-30 °C) for about 50-60 min until they are doubled in volume. Spray little water on them and sprinkle sesame seeds. 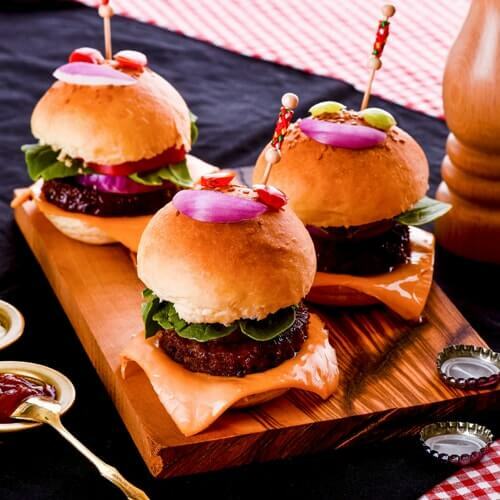 Bake for 8-10 minutes in a preheated oven at 230-240 ° C.
On the other side, fry the hamburger meat pattes in a frying pan. Divide your bread in two, put the meatballs, onion, rocket and pepper on top of the cheese, respectively and cover with the other part of the bread. Cut the round pieces from the peppers for use in the eye decor. Also use red onion for use in mouth decor. In a bowl mix flour, rice, salt, yeast, lukewarm water, yoghurt and oil. Knead until you get a homogenous dough. Make about 100 g tangerine-sized balls out of the dough and let it rest for about half an hour covered with a damp cloth. Spread the dough with rolling pin to a diameter of approx. 30 cm. Using oil-free pan, bake the both sides in the high heat. Keep baked tortillas under a cloth. It would be the best if they remail air-free. For the sauce; mix all the ingredients and put them in the fridge. On the other hand, cut the chickens into cubes and saute them little oil, season with salt and curry. Slice tomato, red onion, rocket and parsley in a thin shape. Chop red pepper in ring shape. Take one tortilla, spread cream sauce all over. 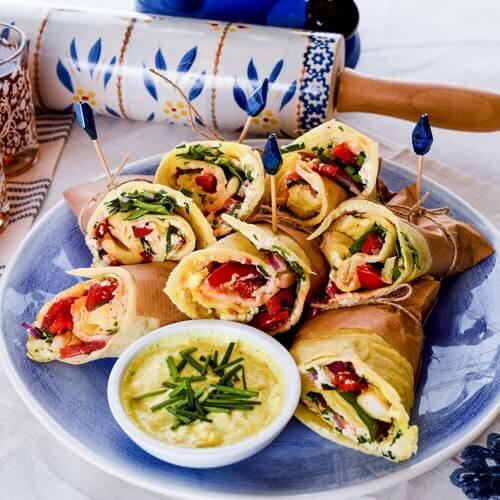 Add the garnish and make a wrap. Chop onions, add ground meat and season with salt and pepper. Mix all of the ingredients for the batter except butter and knead until you have a smooth dough. 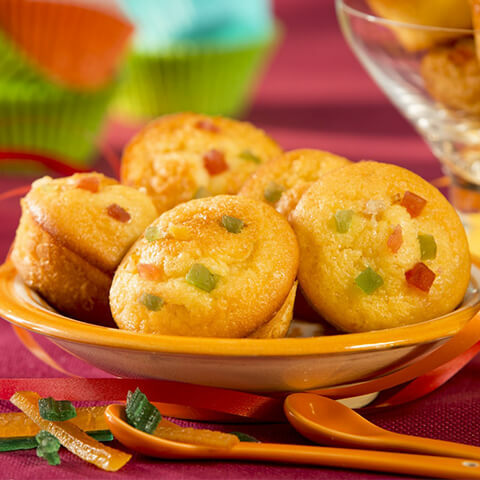 Divide the dough into tangerine-sized equal pieces of approximately 100 gr and roll them finely. Leave the doughs to rest for 20-25 min with a damp cloth covered. Spread the doughOpen the rest of the dough with the okla on the size of the yufka and rub the butter softened at room temperature. Again on the size of the flour, open the other dough roll and butter on it. 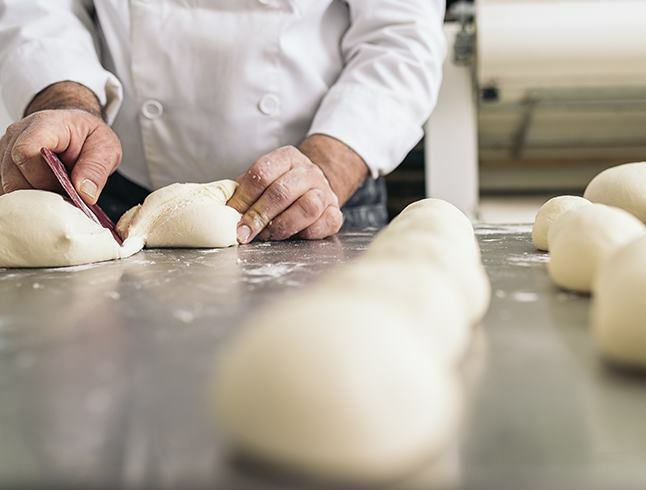 Continue this process until your dough is finished. Do not oil on the top dough. Open this layered dough again with a roll, and roll firmly. Keep in the freezer for 15-20 minutes. Remove the roller and stretch it on the counter. Cut at 2 cm intervals. Press it with your hand and open it with a rolling pin. Put a meal spoon in the middle of the dough and put it in a triangular shape and place the covered alum in the next oven-baked oven. Spread the eggs on it, sprinkle the donut. Bake for 15-20 minutes in the oven, preheated to 170-180 ° C. Serve hot. Dissolve yeast in warm water and wait 10 minutes until it’s frothy. Stir in sugar, milk, egg, salt, and flour to make a soft dough. Knead for 6 to 8 minutes on a floured surface until the mix becomes smooth. Place dough in a well oiled bowl and let it rise 1 hour until the dough has doubled in volume. 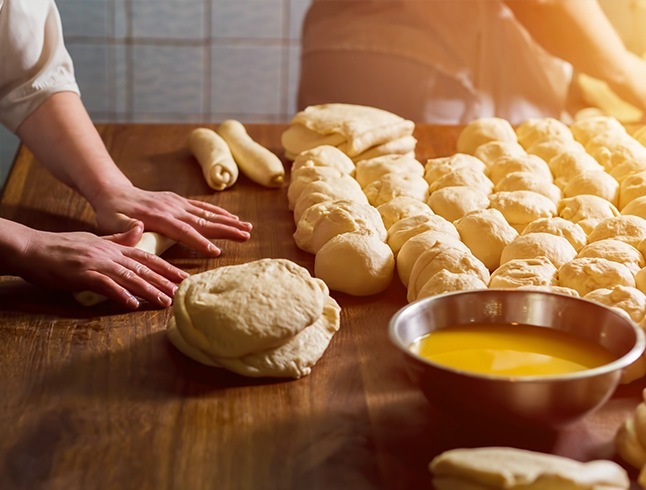 After an hour, punch down dough and knead with garlic and pinch off small handfuls of dough (more or less the size of a tennis ball) Place your dough ball on a tray and allow to rise until the size has doubled about 30 minutes. Roll one ball of dough out into a thin circle and place dough on grill until puffy and lightly browned. Brush uncooked side with butter, and cook until browned, 2 to 4 minutes. 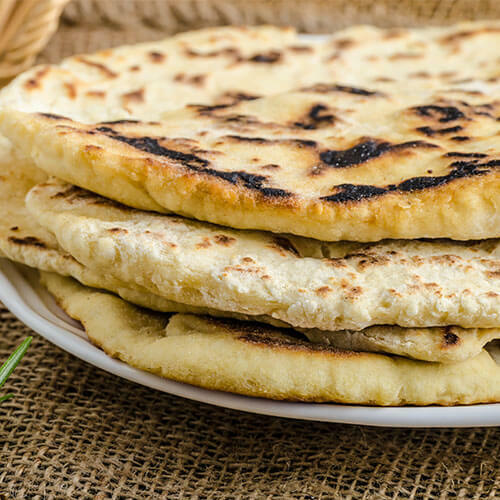 Continue the process until all the naans have been prepared. Combine yeast, flour, water, cream cheese, salt, sugar and olive oil in a bowl and knead to a smooth, non-sticky dough, cover with a towel and leave to rest for 45 minutes. After dividing the dough into 6 balls of 140 g and rolling out, put them on a baking tray covered with baking paper. Cover with a towel and leave to rise for 20 minutes. Bake in a preheated oven at 230°C for 12/15 minutes. Combine oil, paprika, ginger and curry powder in a bowl and add the chicken breast pieces cut into small pieces.Leave to marinate for 15 minutes. In a bow, mix the cottage cheese, the lemon juice and 1 chopped clove of garlic with salt and pepper. Fry the chicken pieces in a pan for 10 to 15 minutes. Mix sliced tomatoes, onions and lettuce with fried chicken. Cut your breads in half, spread with the cottage cheese mix and fill with the chicken. 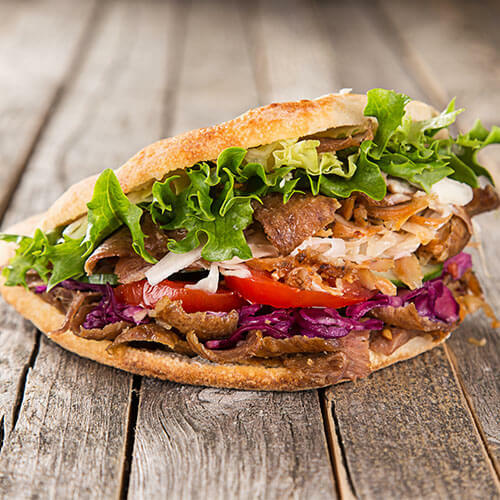 Close the kebabs and bake at 200°C for 4 minutes. Mix the flour, Saf-instant yeast, salt and oil together in a bowl and knead until you have a soft and smooth dough.Then leave to rest for 2 hours. 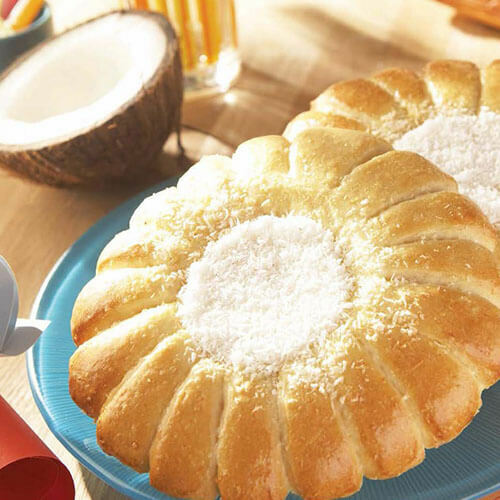 Presentation tip: Cut the dough with a personshaped pastry cutter before cooking! For the first step, pour the flour into a bowl and add the sugar and the salt.Add Saf-instant yeast and leave to rise 10 to 15 minutes. Warm the milk and the water in a saucepan and pour the mix into the flour and knead to a non-sticky dough. Cover the bowl with a towel and leave it rise for an hour Oil baking tray, roll out the bread to flatten it and cover it again to rise for an hour. 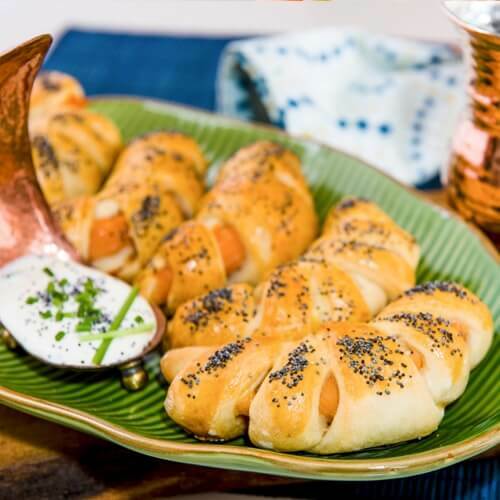 When the dough has rised, brush the bread with egg and sprinkle with sesame. Chop the chicken into small dice, cover the pieces with lemon juice and marinate for one hour in the fridge. Finely chop the onions, garlic, the parsley and coriander and add them in a bowl and mix well. Add the diced chicken and cover well with the marinade and leave to marinate for 2 hours in the fridge. Cook the marinated chicken into a frying pan for 10 minutes. When the chicken is cooked add the olives and remove from the heat. 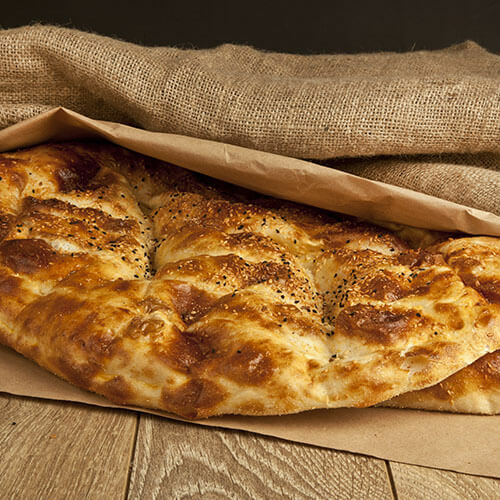 Top the dough with filling and then cover up with the dough.Bake the bread for 20 minutes at preheated oven to 220°C. Knead your ingredients in a bowl until you get a soft dough. Cover the bowl with a plastic wrap and let it rest for 10 minutes. Cut your dough into 4 pieces, round and let it rest again for 10 minutes . Put the dough on the oily tray. Proof the pita 25-30 minutes. Bake in the oven at 240-250°C. 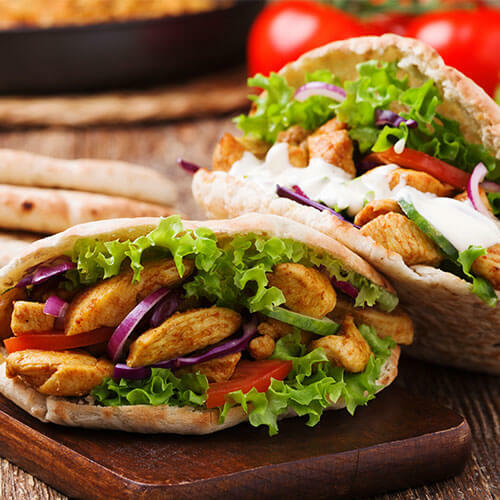 Presentation tip: After Proofing, brush the egg wash and dust sesame on the pita surface. 2- After mixing the dough, cover the bowl with a kitchen towel, leave to rest for 30 minutes at room conditions. "Tips: If dough is too dry, add some water (tablespoon by tablespoon) until dough is smooth and soft. 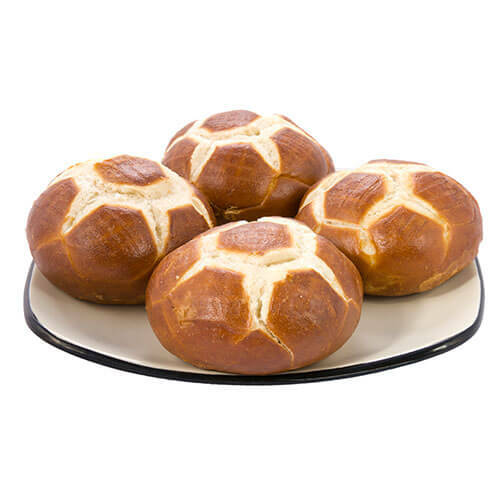 If dough is too soft, readjust by adding some flour (tablespoon by tablespoon) until dough is smooth and soft"
6- Cut the dough surfaces with a knife to give soccer ball shape as in the below pictures. 7- Place the dough pieces on tray covered by baking sheet. 8- Monitor the dough until the size of the pieces has doubled. Bake them for 15 to 20 minutes in preheated oven to 180°C-220°C. Put potato in boiling water and boil for 15 minutes. Discard potato and let water cool. Transfer 1/3 cup of the potato water into a small bowl, sprinkle yeast over the top of water and stir. Set aside for 3 minutes. Sift flour, salt and sugar together into a large bowl, add Saf-instant yeast mixture. Stir in another 2/3 cup of the potato water and oil. Add eggs, one at a time and stir briskly until a dough ball is formed. Turn dough out onto a floured surface and knead for about ten minutes until dough ball is firm, adding a little extra flour if needed. Place in a greased bowl, turning the dough so all sides are greased. Then, cover the bowl with a clean towel and rest in a warm place for 1 hour until dough has risen to double size. Punch the risen dough down to flatten and remove from bowl. Cut dough into 18 equal pieces and shape each piece into a 6 to 7 inch long, 3/4 inch thick rope. Bring the ends of one rope together and pinch closed. Repeat until all rings are formed and cover with a towel and let rise for 20 minutes. Lightly grease a cookie sheet and dust with cornmeal. Bring the 2 quarts water to a boil. Add the remaining tablespoon of sugar to the boiling water. Drop the bagels into the water one at a time, cooking each for 3 minutes, turning once. As each bagel is removed from the water, place it on the cookie sheet. 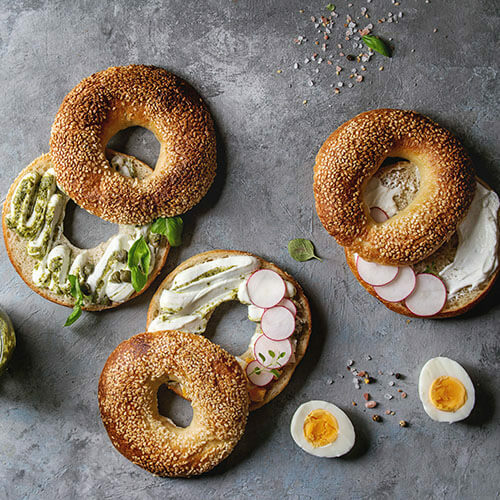 If desired, paint the tops of the bagels with 1 egg white. Bake bagels in preheated oven to 450 F /230 °C for 13 minutes. In a mixing bowl, combine the egg with sugar, melted butter, flour, salt and Saf instant yeast until a smooth, supple dough is formed. Leave to rest for 30 mins in a warm place until the dough has doubled in volume. Once the dough has risen, place it on a worktop and punch down once firmly to remove air. Cover with a clean tea towel and leave to rise again for 3h. Now, work the dough quickly to remove excess air and then divide it into 12 balls. 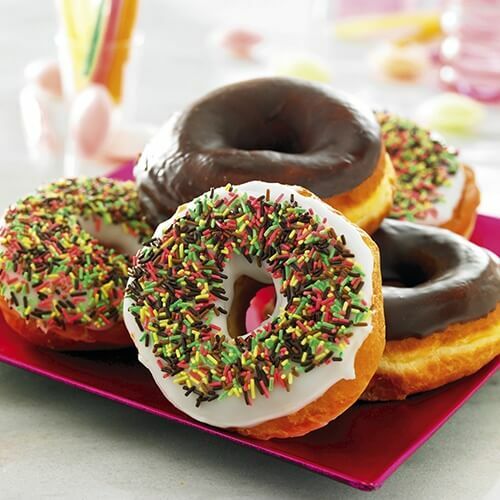 Make a hole in the centre of each ball and swirl dough around your finger for 10 seconds to create a ring doughnut shape. Heat oil to frying temperature. As soon as it bubbles plunge doughnuts into oil in batches of three or four (they should fall to the bottom then rise to the top almost immediately). Allow to cook for 2 mins, turn them over and leave to cook for another minute on the other side. Remove from frying oil and allow excess oil to drip off on absorbent paper. 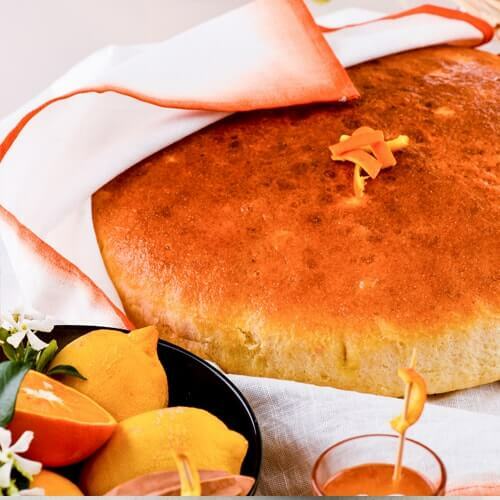 In a mixing bowl, combine the flour, eggs, softened butter, Saf-instant yeast, milk, salt and the sugar until the dough no longer sticks to the sides of the bowl. Cover with a clean tea towel and leave to rest for 45 mins in a warm place. Place the dough on a floured worktop, flatten with hands and divide into two equal parts. Transfer dough to two lightly floured cake tins. Press down well to obtain a fairly dense crumb. Leave to rise for 1h 30. Bake in oven, pre-heated to 220°C, for approximately 35 mins. Make sure to place an oven-safe cup or shallow tin of water in the oven to aid rising. Remove from tin and set aside for 48h. Now cut the bread into slices and toast in the oven on a baking tray at 200°C until the rusks turn golden (about 15 mins). Serve your buttered bread rusks topped with jam or chocolate. In a mixing bowl, combine the flour, salt, and the Saf-instant yeast. In another bowl, mix together the sugar, milk, butter, eggs, egg yolks and orange flower water. 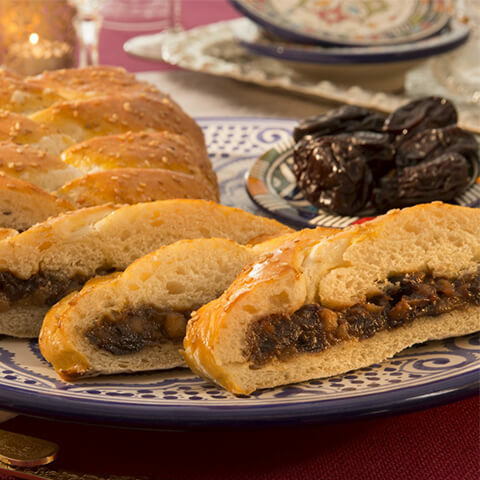 Using a spoon, gradually incorporate the dry ingredients followed by the pieces of candied orange and raisins and mix until a consistent dough is obtained. Knead and shape into a ball. Transfer the dough to a bowl and cover with a clean tea towel. Leave to rest for 1h. 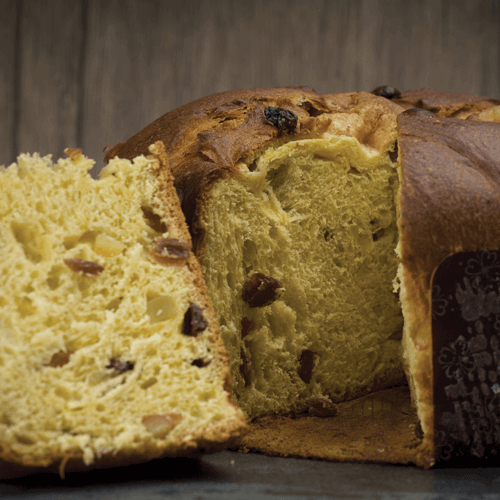 Once risen, work the dough gently to remove the air and place in a generously buttered panettone mould. Brush the top of the dough with oil. Cover with plastic film and leave in a warm place to rise until the dough has reached the top of the mould. Using a serrated knife, mark the top of the dough with a cross and bake in a pre-heated oven for 40-50 mins at 180°C. In a mixing bowl, combine the flour, sugar, salt, eggs and the Saf-instant Gold, gradually adding the warm milk until the mixture forms a soft, consistent dough. 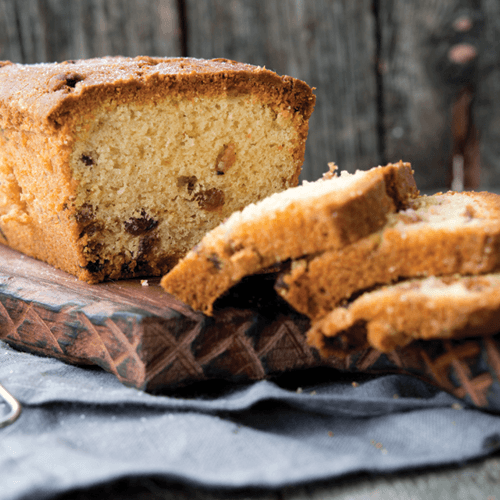 Incorporate the raisins and softened butter, kneading until they are well combined. Leave the dough to rise. Knead again and leave to rise for another hour in a warm place. Knead the dough a final time and divide into six equal-sized balls. 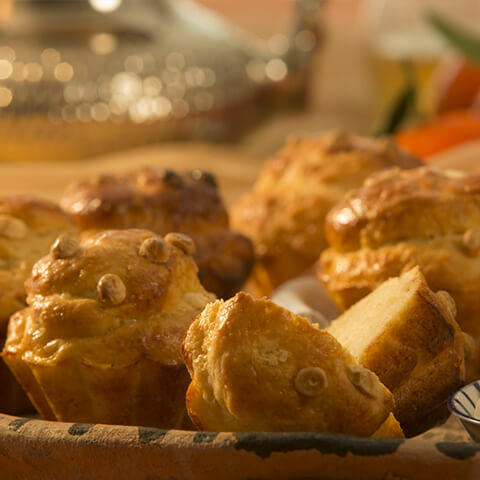 Place the dough balls in a greased tin or on a baking tray depending on the desired shape. Using a pastry brush, coat the brioche with the beaten egg and leave to rest for 1h, covered with a clean tea towel. Coat the brioche again with the egg and bake in the oven for 30 mins at 240°C. After mixing the flour, the sugar and the salt in a bowl, add the warm milk, the honey and 11 g Saf-instant yeast into the dry mix. Mix with a spatula for 2 minutes, then add the butter in small cubes and 75 g of the shredded coconut and knead again until the dough becomes smooth. Shape a ball with the dough, place it back into the bowl and cover with a damp cloth and leave to rest for 45 minutes in a warm place. Divide the ball it into 12 small equal balls and flatten them with a rolling pin and place them on a baking tray, making sure you leave at least 5 cm between each one. Make cuts in the dough to replicate rays of the sun using a knife. Then leave to rest again until they have doubled in volume about an hour. 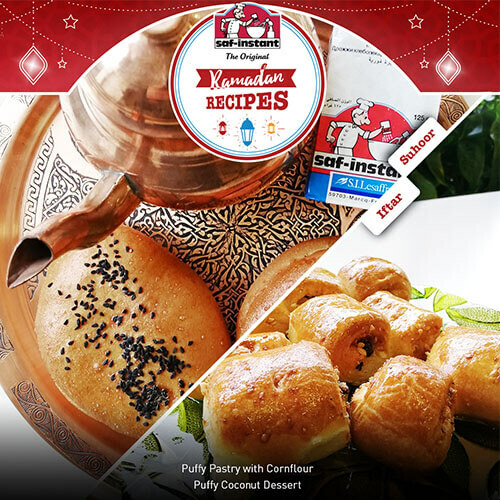 Brush the tops of the suns with a beaten egg and sprinkle them with the leftover 50 g shredded coconut and cook in the preheated oven at 180°C for 12 to 14 minutes. In a mixing bowl, beat the sugars with the eggs. Add the flour, the yeast dissolved in warm coconut milk, oil, salt and a few crushed M&Ms. Fill the paper cases three-quarters full and top with M&Ms. Bake in a preheated oven at 180°C for 20 to 25 mins. Mix all the dough ingredients together and leave to rest for 2 to 3 hours. Fill the paper cases two-thirds full with the dough and bake in a preheated oven at 210°C for 20 minutes. 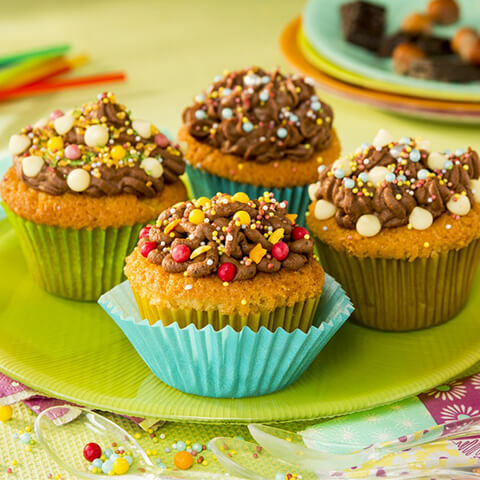 When cool, pipe a mixture of melted chocolate, mascarpone and Chantilly cream on top of the cupcakes. Refrigerate. Separate the eggs. Beat the yolks with the sugar. Then add the flour, yeast and the whites, beaten until stiff with the salt. Pour the mixture onto a rectangular baking tray covered with baking paper. Bake in a preheated oven at 210°C for 25 minutes. 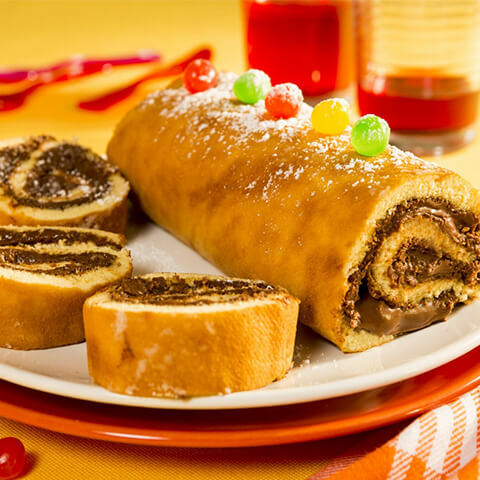 While hot, place the cake on a damp kitchen towel, spread with chocolate hazelnut spread and carefully roll it up. Wrap in the towel and refrigerate until serving. 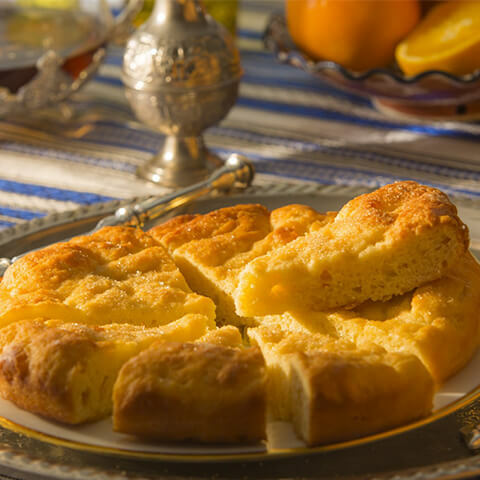 Mix the condensed milk with eggs, vanilla, milk and yeast mixture, flour and softened butter. Divide the dough in half. Mix one half of the dough with the two chocolates melted in the milk. Pour both the plain mixture and the dark and milk chocolate mixture into a buttered and floured tin to create a marbled effect. Bake in a preheated oven at 180°C for 50 mins. Put the yeast in a bowl and dissolve in 100ml of warm milk. In a large mixing bowl, mix the flour, sugar, salt, milk and yeast mixture, yolks and the remaining milk, and whisk together well. Cover with a clean cloth. Leave the mixture to rise. It should double in volume so leave for an hour. Then, add the egg whites (whisked until stiff). Heat a small blini pan and add a knob of butter. Cook the blinis for 3 minutes on each side over a moderate heat. 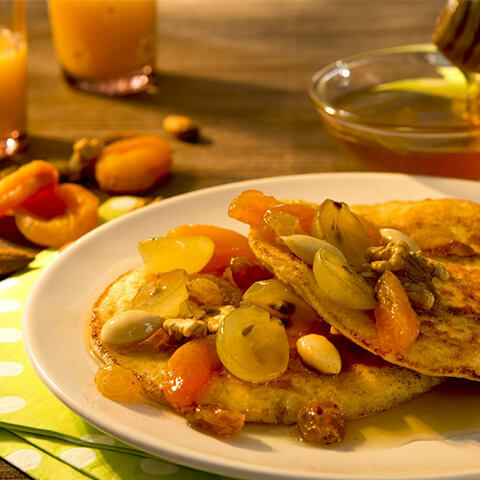 Warm the honey with the chopped fruit and nuts and pour over the warm blinis. Mix the yeast, sugar and warm water in a bowl. Leave for 10mn. In a large mixing bowl, combine the flour, salt and the water and yeast mixture. Mix well, cover with a clean cloth and leave the dough to double in volume for 3 to 4 hours. holes with your thumbs, make a ring and put it in the smoking-hot oil. Repeat with the other sfenj, turning them in the oil to make sure they are golden brown on both sides. Soften the prune cream ingredients in butter and cook for 15 minutes uncovered, to make a compote. The dough will rise, then bake. They should take 35 minutes. In the mixing bowl, dissolve the yeast in warm milk, add the flour, sugar, eggs and salt. Mix for 8 minutes until the dough comes away from the sides. Add the butter and mix for another 8 minutes. Put the dough in a large bowl and cover with a cloth. Leave to rise for 2 hours. Roll out the dough on the worktop. Fold in half 3times, then leave to rise for another hour. Roll out the dough. Make indentations in the dough, and put the diced pieces of butter in the holes. Sprinkle with orange flower water. Sprinkle all over with sugar. Bake for 20 minutes in a preheated oven at 200°C. The dough should be golden and the sugar should form an irregular crust. Combine all the dough ingredients and leave to rise for 2 hours. 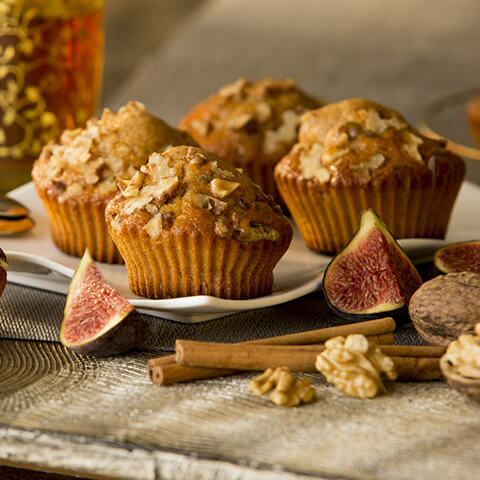 Roll out on a floured worktop and make 8 rolls adding fig and walnut pieces to each one. Leave to rise for another hour. Bake in a preheated oven at 180°C for 40 mins. In a mixing bowl, combine all the dough ingredients except the chocolate drops. Cover with a cloth and leave to double in volume. Roll out the dough. Cut out 8 squares. Add the chocolate drops to each square and roll into a ball. Glaze with egg yolk mixed with 1 tbsp of milk. Leave to rise for 30 minutes and bake in a preheated oven at 190°C for 15 to 20 minutes. Beat the 6 eggs with the sugars, salt and honey. Add the melted butter, flour and yeast and the candied fruit. Leave to rest in the fridge for 20mn. Bake in buttered Madeleine moulds in a preheated oven at 220°C for 5 minutes, then at 200°C for 12 minutes. 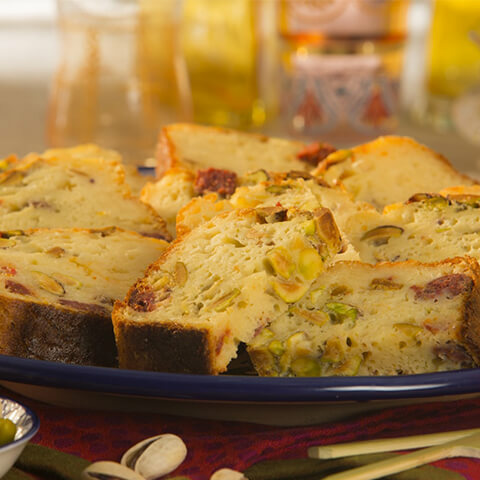 Combine all the dough ingredients, pistachios and grated cheese. Butter a loaf tin and pour in the dough putting the merguez in lengthways. Leave to rest for 2 hours. 1. Preheat the oven to 210 °C. 2. Dissolve the yeast in 3 tablespoons warm milk. Add a sugar cube and crush together. 3. 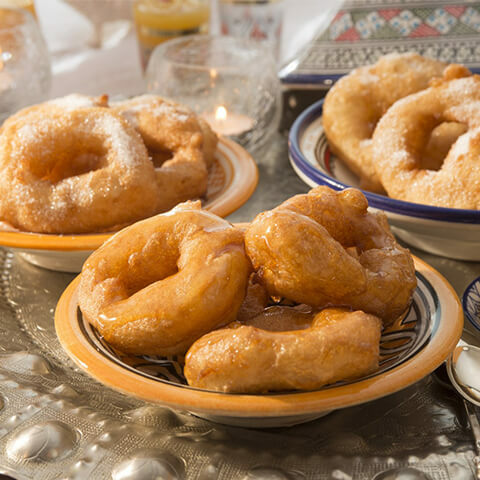 Place the flour in a bowl, and mix in a pinch of salt, the beaten eggs, the warm, melted butter and the castor sugar. 4. Allow the dough to rise. Grease a tin with butter and coat the inside with flour. 5. Leave the dough to rise until doubled in volume, covering with a teacloth for 1 to 2 hours. Bake for approximately 30 minutes. 6. 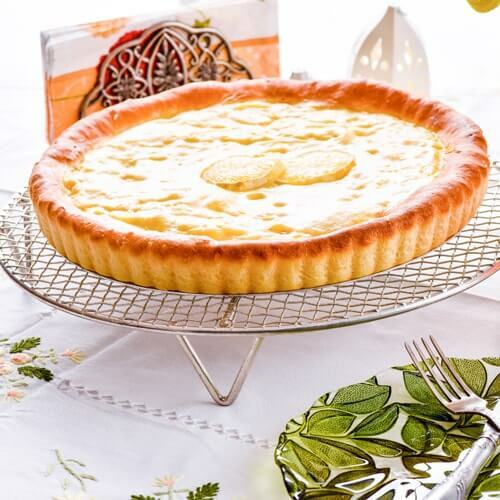 To make the topping: Mix together the castor sugar, the egg and butter.Spread on top of the tart and return to the oven for a further 10 minutes. In a large bowl mix flour, semolina, salt, sugar and yeast. Add eggs, lemon juice and melted butter. Pour the warm milk gradually and mix. Then add the grated lemon and orange pees and knead until the dough is soft and homogenous. Place the dough on a greased oven tray. Cover with a damp cloth and leave to rest for 30-40 min at the room temperature (25-28°C) until the dough is doubled in volume. Cover the dough with beaten egg with the help of a brush. 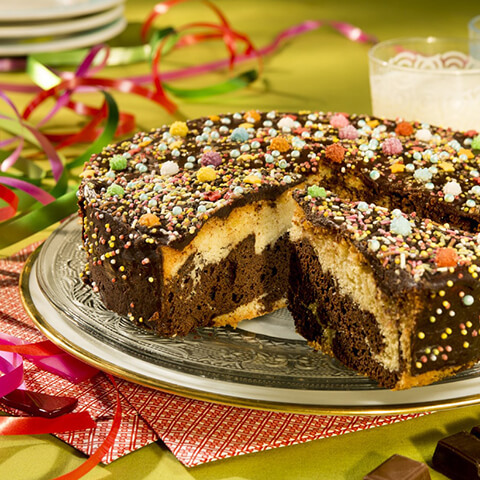 Bake for 20-25 minutes in the preheated oven at 210-220 ° C.
Mix flour, yeast, sugar, salt and eggs in a large bowl. Add butter and knead until you get a homogenous dough. Divide the dough into two pieces, spread it using a roller pin and place it in the pie pan. Cover with a damp cloth and let stand for 10-15 minutes. Make some holes on it with the help of a fork. Grate the lemon peel and squeeze 1 lemon juice. On the other side, add 80 gr of sugar with vanilla and boil. While this mixture is being cooked, whisk 5 eggs in another bowl and with the remaining 50 gr of sugar. Add grated lemon peels and flour into this mixture and blend to get a cream. Add hot milk and cook until it boils. Turn off the hat and add lemon juice and butter and give it a stir. Cover with a plate and cool for 15 minutes. After the garnish has cooled down, pour over the dough we have placed on the pie pan and flatten it. Garnish with lemon slices and cook in a preheated oven for 15-20 minutes at 220 ° C.
Mix flour, sugar, and yeast in a large bowl. Beat the eggs thoroughly in another bowl and add to that. Knead until the dough is homogenous. Cover it with a damp cloth and let it rest for 1.5 hours. Spread the dough onto the floured worktop and cut circular shapes with the help of a glass. You can fry the dough without any filling. 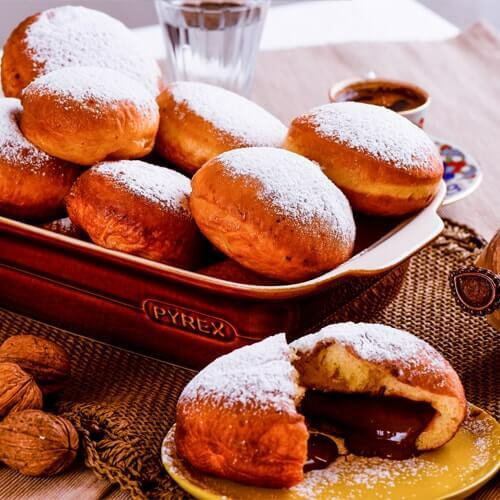 You can also put nutella or sour cherry on each piece of circular dough, cover it with another dough and press it on its edges. Place the doughs on a tray and cover with a damp cloth leaving rest for about 30-40 minutes until the volume is doubled. Heat oil in a pan. Fry the fritters until they are golden and puffy. Drain the oil wit the helop of napkin. Serve with powdered sugar on it. Mix the butter cut into pieces the ground almonds and the eggs in a bowl. 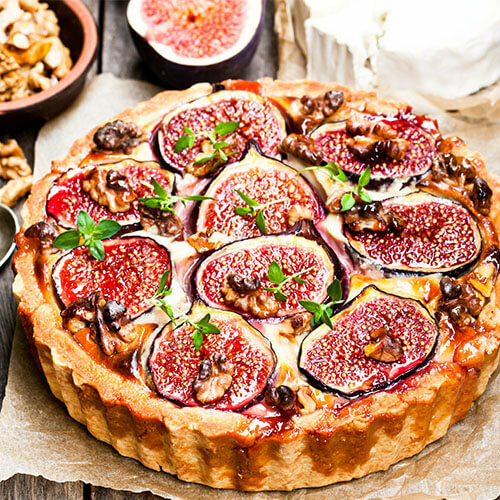 With the mixture, cover the base of the tart and put the cut figs on top. Cook at 200°C for 30 minutes. In a pan, mix the honey and lemon juice and pour the sauce over the figs and leave to cool. Mix the milk, honey and Saf-instant yeast, leave it to ferment for 15 minutes. Then, mix the flour, almonds, salt, walnut oil with the milk mixture. Soak the apricots in 100 ml boiling water for 10 minutes. Knead for 10 minutes and incorporate the apricots. Cover it and leave to rise for an hour. After, knead the dough again for 2 minutes and divide it into two equal pieces. Knead them once more and shape them into little rolls, place them on a baking tray with baking paper and brush with egg. Leave to rise for another 45 minutes. Bake the rolls for 30 minutes preheated oven to 240°C. After 10 minutes, turn the oven down to 210°C. Leave to cool on a cooling rack. Once the mixture has cooled, add the eggs, Saf-instant yeast and 2 cups of flour. Mix till smooth and rest for 10 minutes. Then, add in the salt and some flour an mix. Once the mixture becomes to hard to mix in the bowl pour out onto a flat surface and continue to knead for 10 minutes. In a clean bowl, add a little oil and place the kneaded dough into the bowl and turn over. Cover with a plastic wrap and rest for 1 to 1.30 hours. Once the dough has doubled in bulk, pour out onto a flat surface. Using a rolling pin, roll out the dough into a rectangle shape and pour the cherry pie filling on top and spread out. Once the cherry pie filling is spread out, sprinkle the chocolate crumbs on top. Roll the dough like you would cinnamon buns. Try to pinch the dough closed as best as possible. Cut the buns with a very sharp knife about 1/2 inches wide. Put onto the tray and cover with plastic wrap and allow to rise for about 1 hour. Bake in a preheated 350F /175 °C oven for 25 - 30 minutes. In a bowl, mix the flour, sugar and salt. Add the warm milk, egg and vanilla. 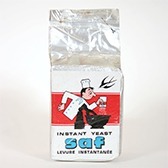 Then pour in the sachet of Saf-instant yeast. Beat with a whisk until you have a smooth paste. Cover the bowl with a towel and leave to rest for 60 minutes in a warm place. Beat with the whisk again. Cook the waffles in a traditional waffle-maker.